British nostalgia for an imperial past imagined as heroic and fabulous has been a persistent feature of culture and politics in the UK since the 1960s, from the early Doctor Who episodes to the ongoing debates about Brexit. A longing for bygone imperial grandeur can also be observed in some of the nation states that have established themselves since 1918 in the territories formerly ruled by the Habsburg Empire. Although the links between past and present are more fractured, complicated and contested in these contexts, imperial nostalgia still transpires for example from the Austrian film ‘1 April 2000’ that promoted the termination of Allied occupation in 1952 and most disquietingly from current Hungarian claims to the ‘lost lands’ that had once belonged to the Hungarian Crown. Assessing and dealing with imperial legacies and traditions poses thus not only a problem for historical research, but also for contemporary culture and politics. It is therefore crucial to venture beyond the simplistic and misleading question, whether this or that empire had been bad or good, and to devise more nuanced perspectives on imperial formations. The distinction between imperial – as the broader term – and imperialist – as the narrower term – forms of exercising power and of governing ethnically diverse populations is one of the ways in which Subjects, Citizens, and Others opens up such more appropriate vistas. Imperial rule could, the book argues, follow imperialist, statist and nation state approaches when it came to the question how tensions between the empires’ cohesion and the ethnic heterogeneity of their populations should be navigated. Depending on which approach policies concerning nationality and citizenship adopted, the effects of actual measures could range from racist discrimination to the inclusive recognition of cultural diversity. As situations and policies varied vastly across different periods and different parts of both empires, the study analyses Canadian and Hungarian, Indian and Austrian, East African and Bosnian as well as British trajectories in order to grasp the very intricacies and inconsistencies that characterized imperial policies. By delving into these multifaceted aspects, the study pays equal attention to developments at the overarching imperial level and to processes that unfolded within the empires’ constituent parts. In terms of methodology this approach allows for a new, balanced and nuanced way to explore imperial histories. The same holds true for the book’s comparative framework. Juxtaposing the British and the Habsburg cases, the analysis emphatically rejects the established dichotomy between a ‘Western’, modern and maritime form of Empire and its ‘Eastern’, backward and continental counterpart. This revision of assumptions and preconceptions deeply engrained in historiography promises to hold a lot of potential for future research. It will hopefully stimulate fresh vistas on transnational history in general and on the history of imperial formations in particular. Such new perspectives might in turn also enable more appropriate and differentiated evaluations of imperial legacies and traditions in the present. They could help to avoid overhasty celebrations of the Habsburg heritage that allegedly make sure that democracy will prevail in the ‘Western’ parts of Ukraine while autocracy will loom large in the country’s ‘Eastern’ provinces. 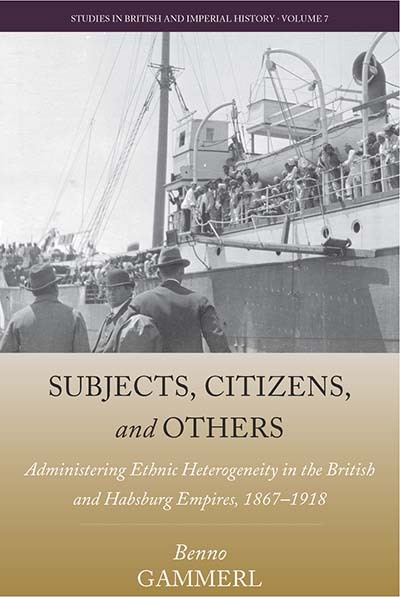 They could at the same time engender a renewed interest in certain aspects of the constitutional arrangements that aimed for the recognition of ethnic diversity in the Austro-Hungarian Empire. Revisiting these might prove conducive to discussions about how the nationals of the European Union’s member states could be integrated into a cohesive, yet diverse citizenry. In a similar vein, such fresh vistas could also help to avoid overemphasizing the achievements of the British Empire, while glossing over the atrocities and injustices it entailed. Yet while it is certainly legitimate to hold the British government to account for the violence and the injuries it committed, it might also be worthwhile to reconsider some of the ideas on how to enable the political participation of an ethnically heterogeneous population that were discussed during the time of British rule in South Asia. Parts of these proposals can still prove valuable in the present, when the predominance of Hindu Nationalism in India makes combining democracy with the recognition of cultural diversity all the more pressing. Along these lines, one can challenge the misleading versions of imperial nostalgia nationalists employ to promote their exclusionary and discriminatory agendas. At the same time, the all too simple and futile question, whether an empire had been bad or good, could be supplemented by much more engaging and fruitful discussions about one of the most pressing issues of the present: How can one fairly organize ethnically diverse bodies politic?